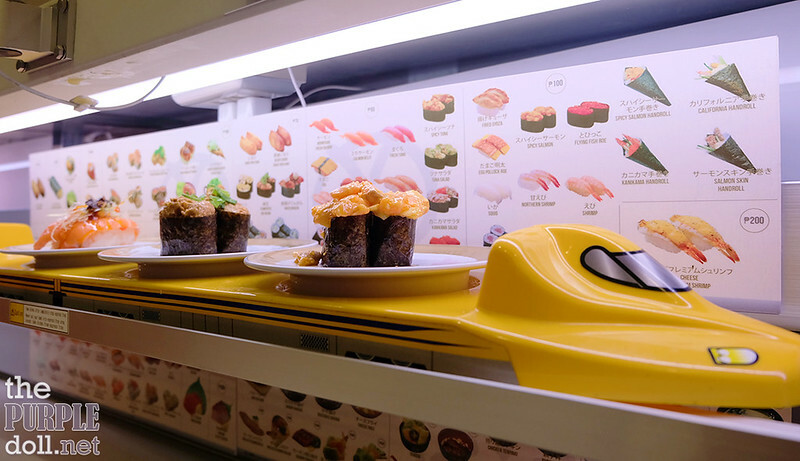 Genki Sushi: Bullet Train Conveyor-Belt Sushi at BGC Stopover, Finally! As a food blogger, most family and friends would ask me for restaurant recommendations. Sometimes, based on restos that really impressed me. But more often than not, they'd ask me for the newest must-try joint in town. But as much as I hate to admit it, they're probably better off looking for these on the other parts of the internet. Although it pains me that I couldn't always try the newest, the best, and the most novel of establishments, I really can't help it. 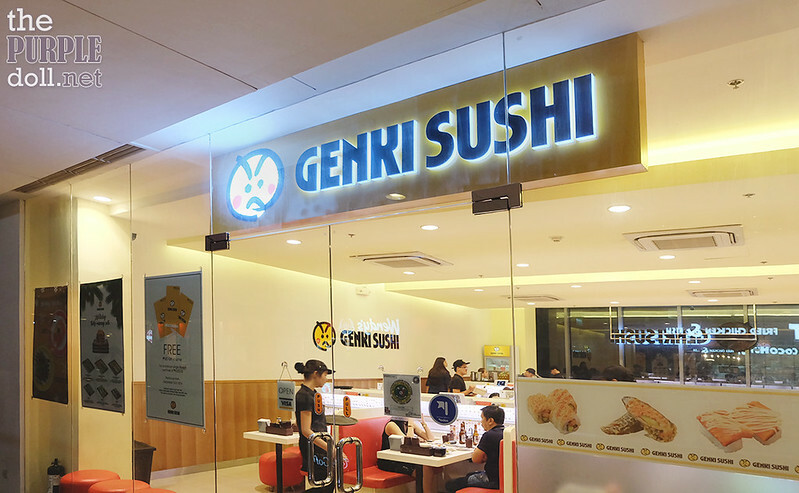 Call me a constant late passenger on the bandwagon, but I still want to share my first experience of Genki Sushi at Boinifacio Global City Stopover, their first Philippine branch which opened back in September 2015. Yeah, yeah, it took me over a year (this visit was back in December 2016) and another branch later (their 2nd store opened at U.P. Town Center back in 2016), before I finally had my first taste of this conveyor-belt sushi franchise from Japan. But although I may be late, I hope this review can still be of help to someone. 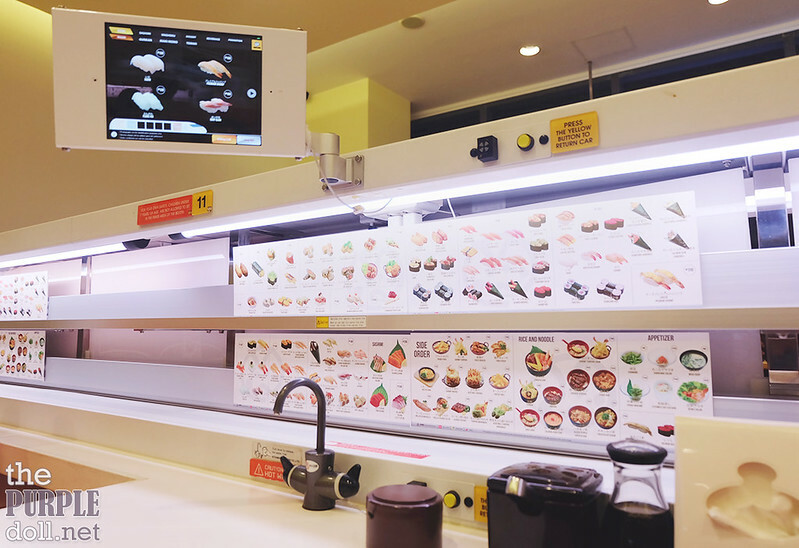 Like most conveyor-belt sushi chains in Japan, Genki Sushi makes use of its automated system of ordering. 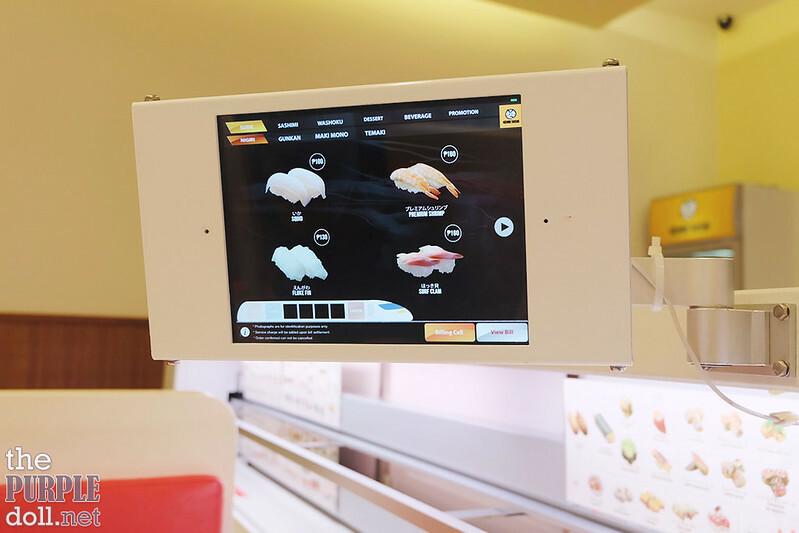 Every booth seating has a touch-screen tablet menu which you use to browse, order and bill out. If it's your first time here or if you're not used to the idea of waiter-less ordering, their staff will be more than happy to help you order. Browse, order and bill out through this touch-screen menu. You can also check how much you've ordered, real-time! Everything you'll be needing to enjoy your sushi experience is also already on the booth. 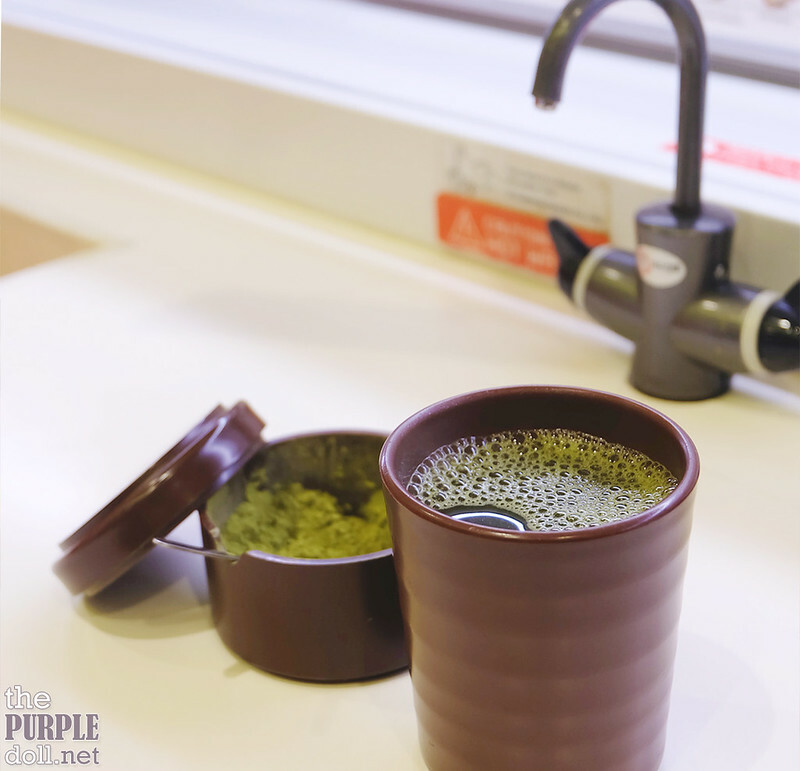 Soy sauce, wasabi, gari or pickled ginger, utensils, even matcha powder and hot water from the spout by your table. We only needed to ask for half glasses of cold water (which we mix with some hot water from the spout). The boyf doesn't like sushi as much as I do. Although sushi is basically fish with rice, he still feels as if a meal isn't fully complete without rice and viand. So to cover his unspoken request, I got us this serving of sautéed chicken and onions in black pepper sauce over steamed Japanese rice. It's pretty tasty, but for the price, I'd rather get something else. Haha! I was excited to see the bullet train bring our first set of sushi orders. Now, we're really talking! The boyf and I both love salmon! But since we usually get plain salmon slices when we eat at Japanese restaurants and buffets, we thought we'd skip ordering them here. 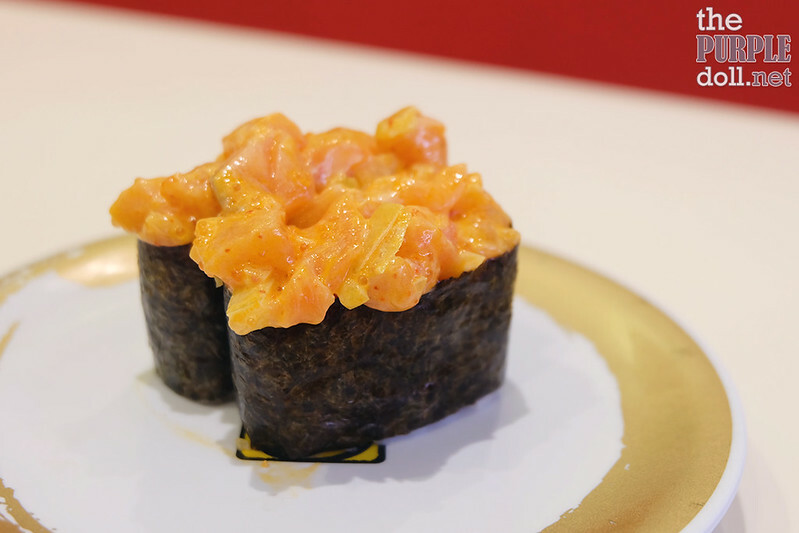 And instead, we went for gunkan or battleship sushi of chopped up spicy salmon. 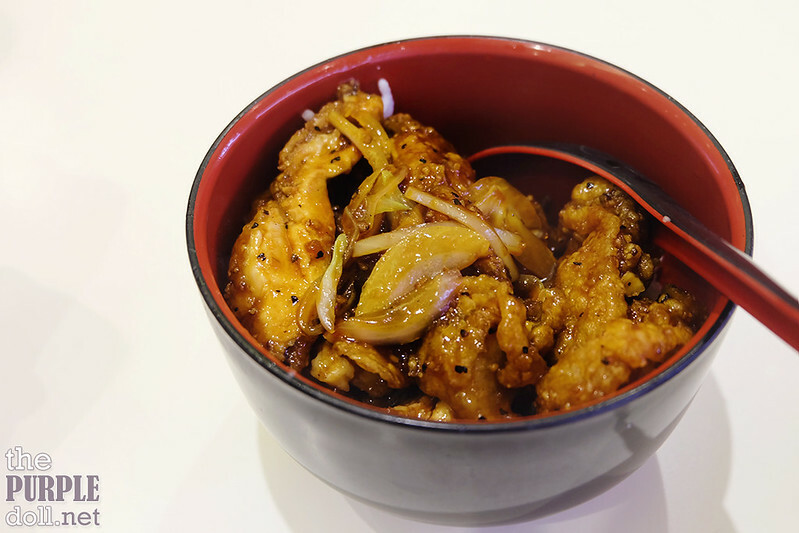 Spicy, savory, tasty -- perfect to whet the appetite. Natto is a famous breakfast food in Japan made from fermented soy beans. Many non-Japanese people don't really like the taste of it. However, I like natto, which is why I ordered upon seeing they offer it. I was also curious whether the boyf would like or hate natto. I initially thought he wouldn't find it pleasant-tasting or would need a long time to acquire a taste for it. To my surprise though, he was okay with natto! Yay! Though to be fair, Genki Sushi's natto has a tamer flavor than others I've tried. 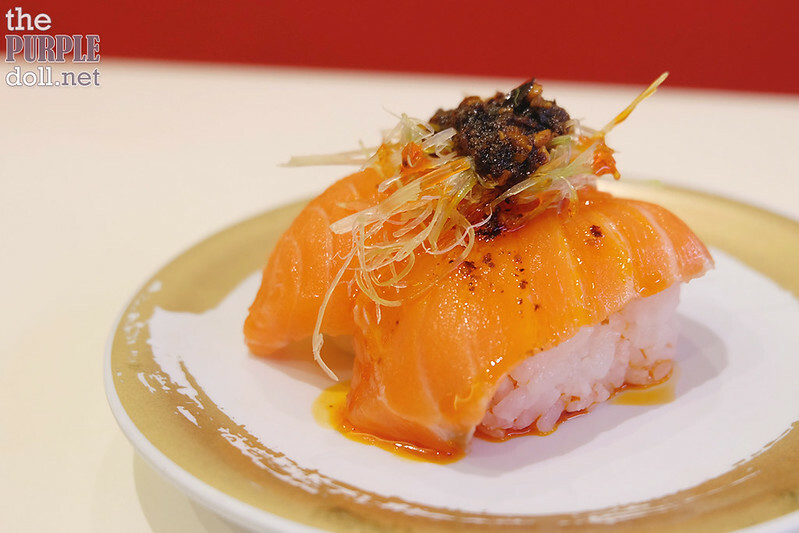 Our first nigiri sushi or hand-pressed rice topped with fish was this salmon one with scallions, garlic and layu or chili oil. It's a tasty morsel, although there was a little disconnect for me in terms of the flavor. The layu tasted too Chinese and didn't harmoniously blend with the salmon. It might just be me though. 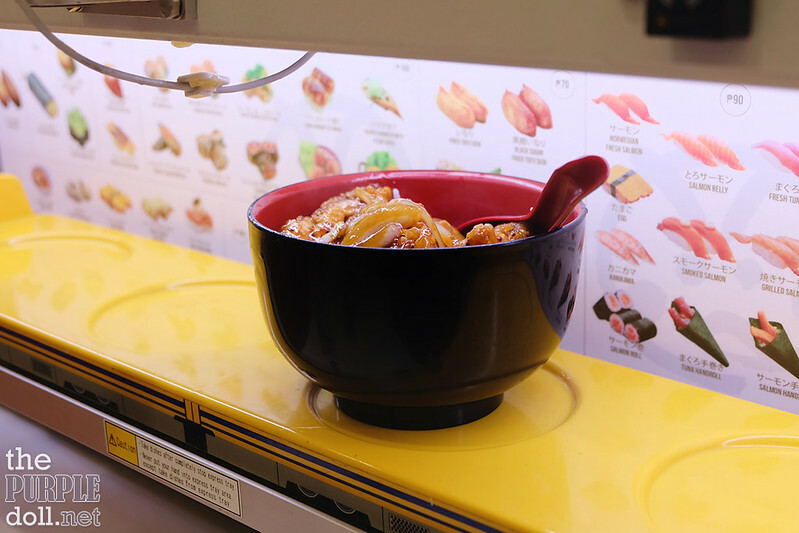 Trivia: Although there are 4 slots on the bullet train, they only bring food by three's. I'd always order 4 items per batch since I wanted to fill up all the slots on the bullet train, but it would always come with one slot free. Hence, the 4th item in the batch would always arrive alone. Toinks! 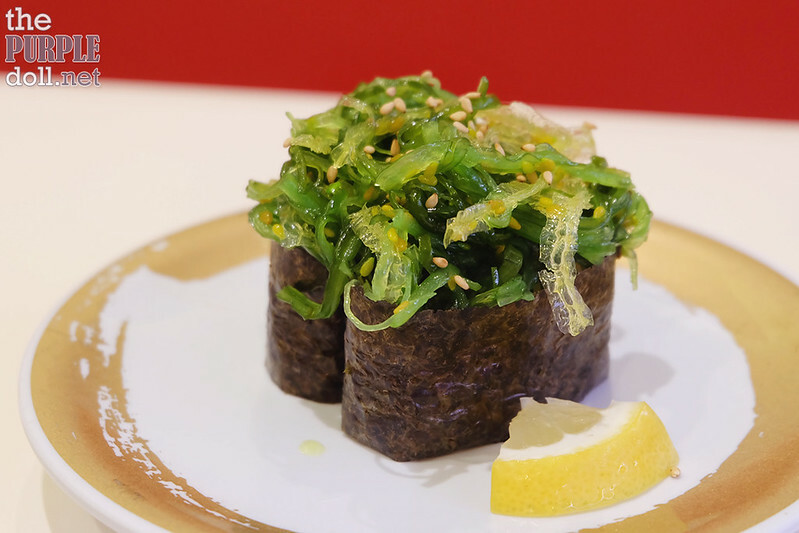 For something light and refreshing, we had a gunkan maki with seaweed seasoned with sesame oil. 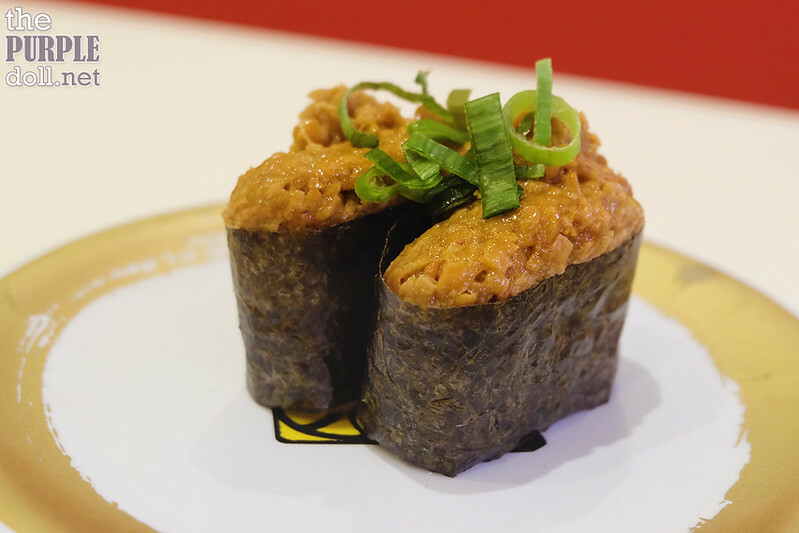 Genki Sushi offers this as a salad item on their menu, though they also have this gunkan maki version on the touch-screen menu. I don't remember how much this was, nor can I find it on any copies of their menu online. 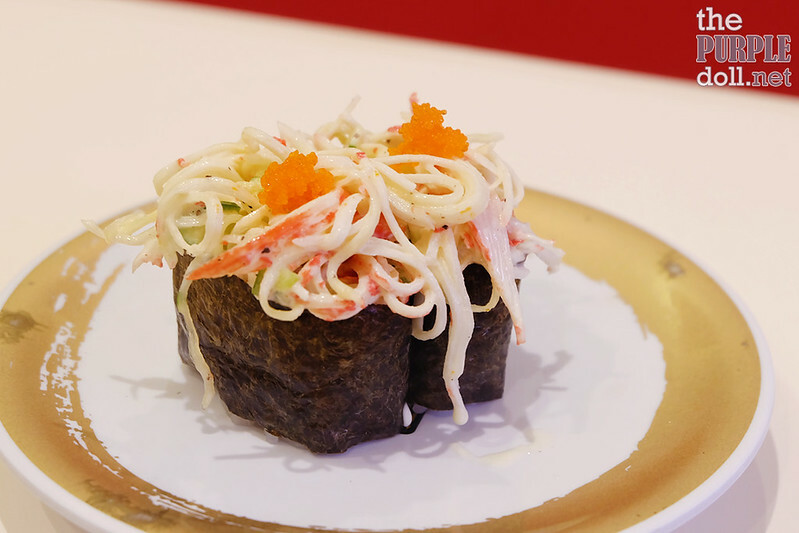 Another Japanese salad in a gunkan maki version was this battleship sushi topped with crab stick and cucumbers in Japanese mayo. This is a good and tasty sushi to order especially for those who are not keen on eating raw fish. This is probably my favorite thing we ordered when we ate at Genki Sushi! The lobster and mayo mixes into this creamy, savory seafood goodness that's hard to get enough of. Seventy bucks for a single piece of sushi in a casual and express-type of sushi restaurant may be a little bit pricey, but I'd gladly order 3 rounds of this next time. Tied with the spicy salmon gunkan for my second spot was this maki of salmon, cucumber and cream cheese coated with fried tempura batter and drizzled with soy and cheese sauce. It's tasty, a little crunchy on the outside, creamy on the inside, and comes in 3 pieces! I may be a little late in trying out Genki Sushi, but I'm glad that I finally did. 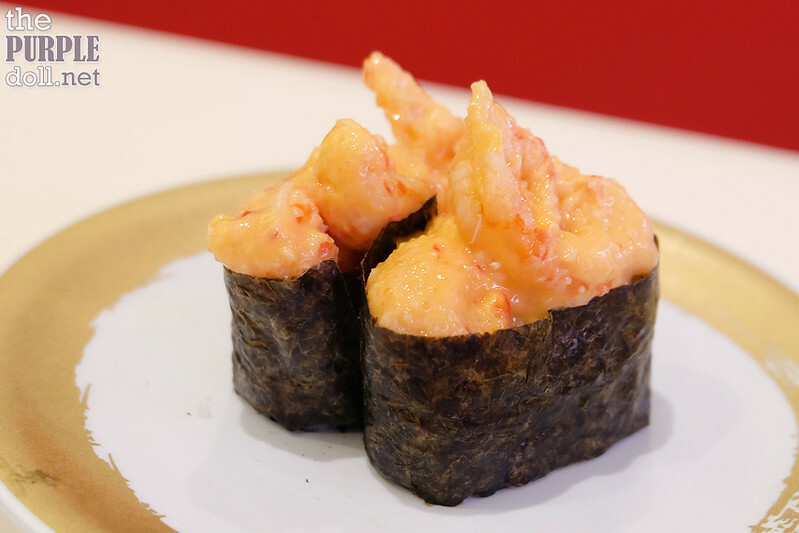 Their sushi may not be extraordinary, but they offer a wide variety on their menu and even a few appetizers and rice meals which are satisfying. 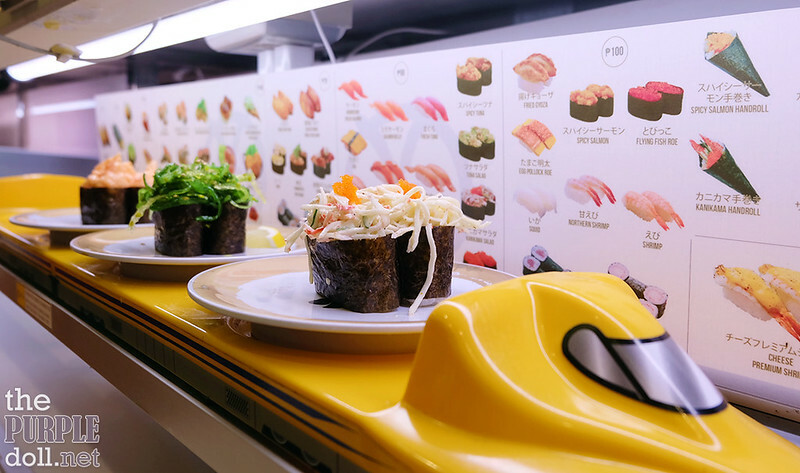 The focus when dining at Genki Sushi though is definitely the experience of automated ordering and the novelty of getting your food served on a bullet train. Even as working adults, the inner kid in us was giddy whenever we'd see the bullet train about to head to our booth! While most items on the menu don't seem too expensive, the damage can easily add up especially when you get too caught up with ordering. 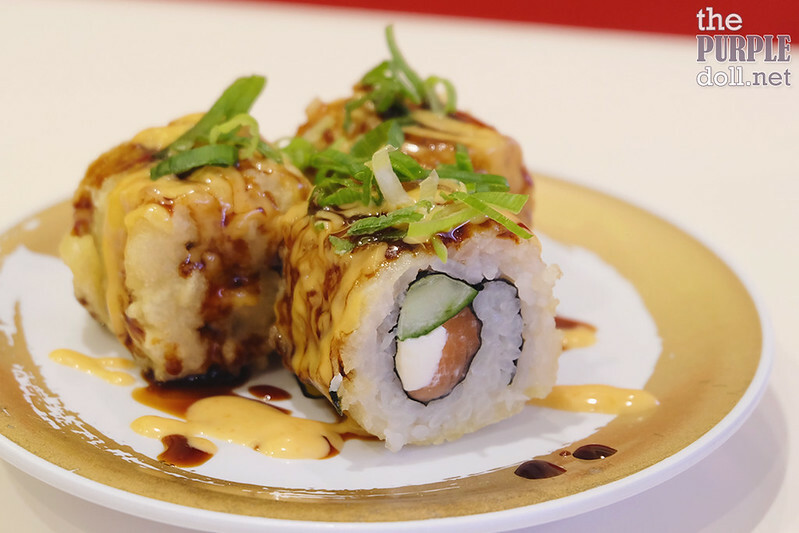 Those with bigger appetites may also have to shell out a lot to get full on sushi. 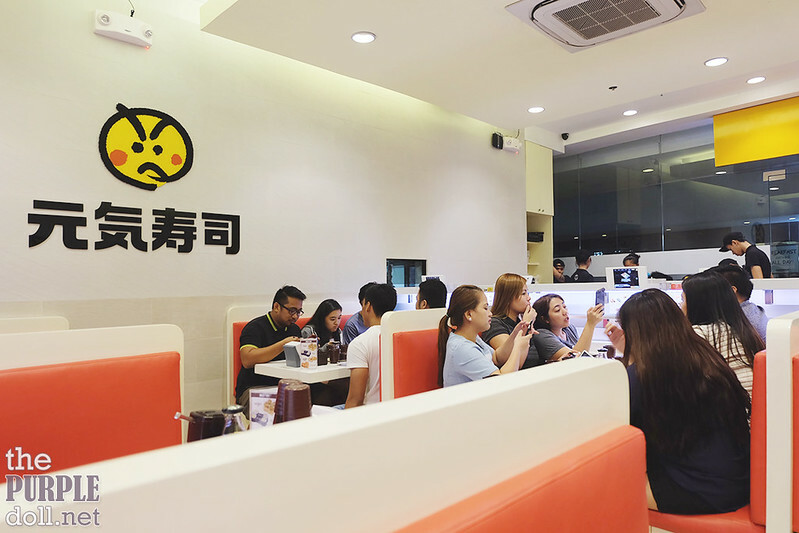 Still, if you can pick a few things to get and enjoy the fun, speedy and efficient automated ordering system, Genki Sushi is a good place to hit when you find yourself with a sudden sushi craving.